The Arctic Circle is at 66 degrees, 33 minutes north latitude, and it's the place where at least on the summer solstice (June 21) the sun doesn't drop below the horizon for 24 hours. We still haven't seen real night even though we're now quite a bit south of the Circle. The 24-hour day (and near-24-hour-day) that we've had is amazing. It's really light all the time. We have not used our camping headlights and won't for some time yet. We did bring blindfolds for sleeping at night and they've been fantastic. Despite the 24-hour day, there is still a cycle to things. It cools off quite a bit at night, and warms up in the day. The insects know about the cycle and function quite adequately. 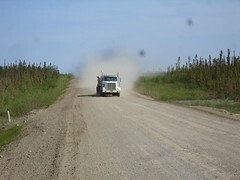 Our first three days from Inuvik were quite hot, which was pretty surprising since we were way north of the Arctic Circle. It was in the 90s Fahrenheit! And the road was dry, and the dust was pretty intense. The road is all dirt of course, and the trucks can raise quite a bit of it. You can imagine the dust-bath we're about to get from this truck! Just at Kilometer 4 of the Dempster we met Christof and Gernot, from Austria, who were just starting up the Dempster. We shared advice and stories and sent them on their way. 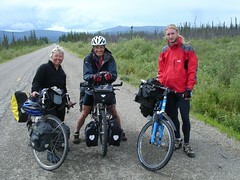 They had just hiked the Chilcoot Trail, canoed the Yukon from Whitehorse to Dawson, put there bikes together, and started up the Dempster! We've met quite a number of cyclists here in Dawson City. What a treat to compare notes with new friends. We're getting showers, even when wild camping! We're terribly pleased with our new Ortlieb 10 liter water bag with shower attachment!. Not only can we haul water, but we can get water and take a shower! We got hot water at the store at Fort Mcpherson (no showers available in town) and took it out of town, found an isolated gravel pit with this abandoned caterpillar. We hung our bag on the equipment and took the most wonderful shower. Between river washes and showers like this we've had several showers already, which is a big breakthrough for this trip! We made it to the Eagle Plains Hotel! 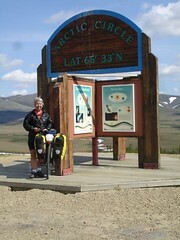 Well, it took us six days but we made it to the halfway point on the Dempster Highway, the Eagle Plains Hotel. We've had a wonderful time - quite a stretch for us to do something this hard as the first thing on the tour, but we're well. The weather has been incredible. Because there's no night, the earth gets lots of warmth from the sun this time of year. In our first couple of days the temperature was in the 80s and 90s Fahrenheit! Really hot. No bears! Nancy's worry level may be decreasing - she spent a lot of time talking with a woman whose extensive experience in the wild in this part of the world (and no problems with bears) gave Nancy more confidence to deal with possible encounters (and less fear that we'll have them). And so far the mosquito season has hardly started. We have plenty of bites, but it's the kind of thing we've experienced before, not the intense disaster people talk about in July up here. However, we have a long ways to go... But we have mosquito outfits and spray and such. Today we're taking a day off and just resting here at the Eagle Plains Hotel. We swapped a night's lodging and dinner with them in exchange for developing a website - http://eagleplainshotel.com - that they've never had before. In Inuvik, SOUTH on the Dempster! We made it to Inuvik and we're headed south on the Dempster Highway tomorrow morning! I'd hoped to have a picture of Inuvik for you but the library is closing so I'm rushing it. 480 miles to Dawson City. A store in Fort McPherson and the hotel at Eagle Plains are the only real things between here and there. It's almost all dirt, and of course we hear all the horror stories about it, like bears and mosquitoes and moose. I think we'll have a blast. We'll let you know in 10-14 days. We're glad to have you along with us! 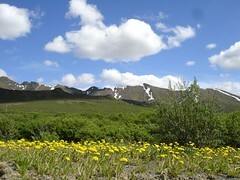 Whitehorse, Yukon. Tomorrow we get to Inuvik! 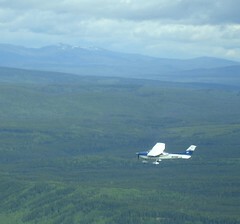 We flew from mile 0 of the Alaska Highway all the way to Whitehorse, Yukon Territory. It's 10:11pm and the sun won't go down for more than an hour. But tomorrow the sun won't go down at all. The flight was wonderful today - we hugged the river due to low-hanging clouds and had great views of beautiful places. The ride over the Continental Divide was spectacular. A few of the pictures are on flickr here. Hope to update you more and provide some pictures from Inuvik, if we have internet access.